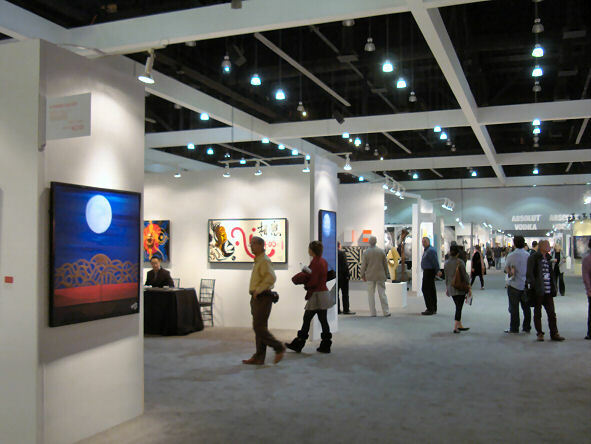 In January, two large commercial* art shows took place in Los Angeles: the LA Art Show and Art Los Angeles Contemporary. I visited both, and will share some of my snapshots and thoughts here. 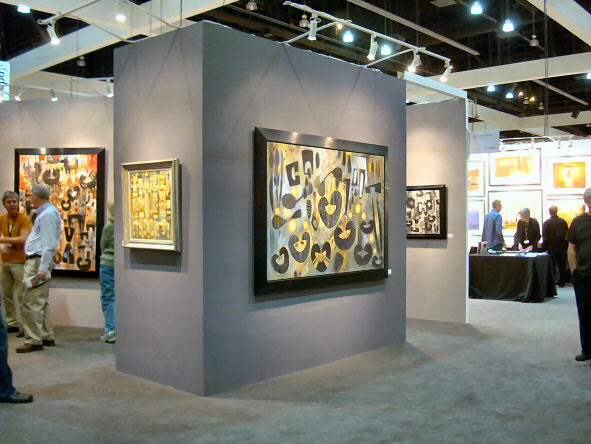 First up: the LA Art Show, the more traditional of the two. 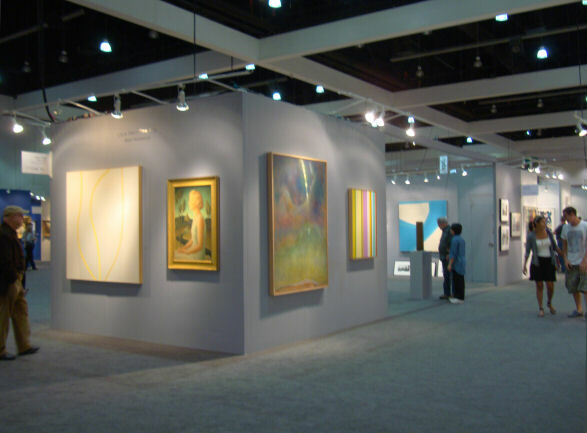 The LA Art Show brings together galleries from all over the world, showing a broad range of visual art from old masters to the work of living artists. This year, Joan Miro was much in evidence, along with Chagall and Picasso (the usual suspects of the “old guard”). There were also plenty of California Impressionists as usual. 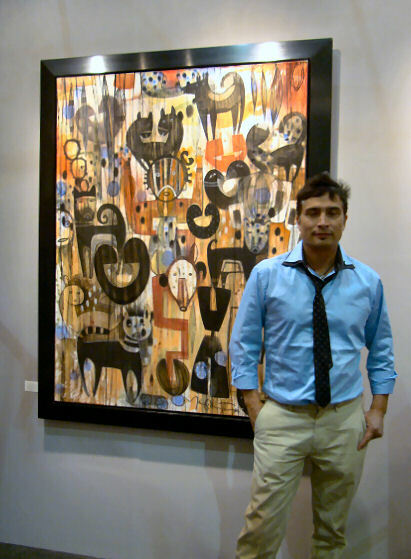 The painting is “Animal Tamer,” 68×54 inches, priced $16,500 and offered through the Blue Rain Gallery of Santa Fe, New Mexico. 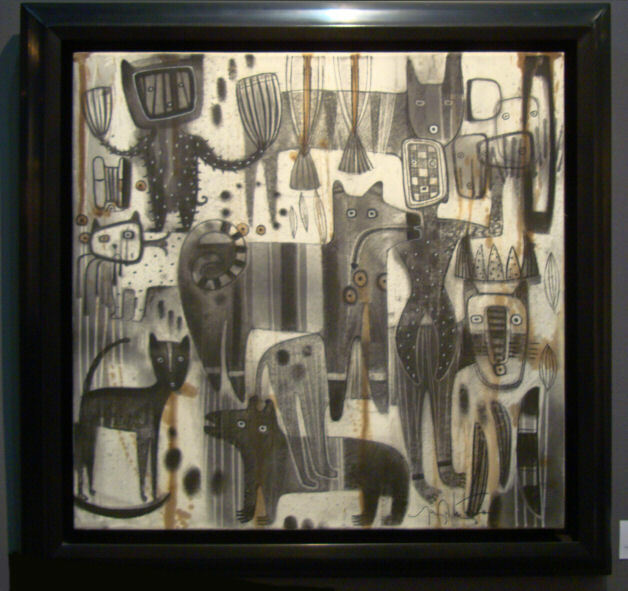 Untitled work in charcoal and ink on paper on canvas by Tony Abeyta, 30×30 inches, $4200 from Blue Rain Gallery. We visited the show on a weekday, which allowed us to enjoy the art without the crowding typical on the weekend. It also allowed me to snap shots of the show without too many bodies in the way. But it was by no means empty. There’s an interesting gradient in the art on display from one end of the exhibit hall to the other. 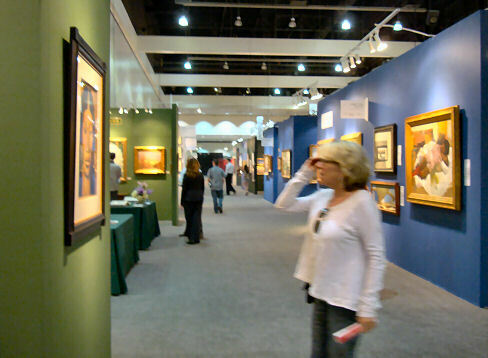 At the far left side the galleries show old masters and California Impressionists (collectively I call ’em the “dead artists.” It’s a widely acknowledged fact amongst artists that the best way to increase the price of your art is to die.). To the far right you’ll find excruciatingly avant-garde conceptual works, with a heavy emphasis on contemporary works from China and Korea (most of which tend to be heavily political). Somewhere down the middle is where I’m at my happiest, amongst the works that try neither to shock nor soothe excessively, but which I find visually intriguing and offer nuanced messages. 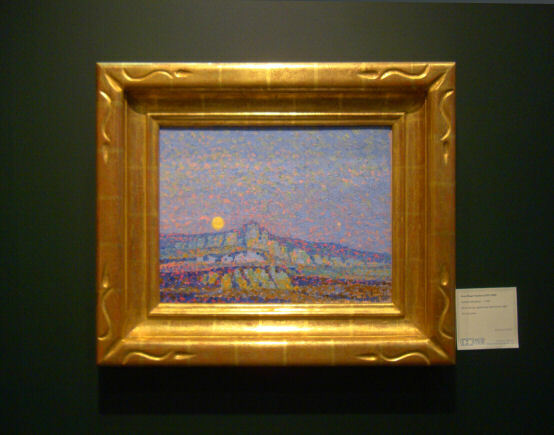 Sven Birger Sandzen (1871-1954), “Untitled (Moonrise)” c. 1914, oil on canvas, 12×16 inches. Offered by David Cook Galleries of Denver, Colorado. Price not posted. Millard Sheets (1907-1989), “Wild Horses” c. 1970, watercolor, 22×24 inches, $28,000 offered by The Redfern Gallery, Laguna Beach, California. 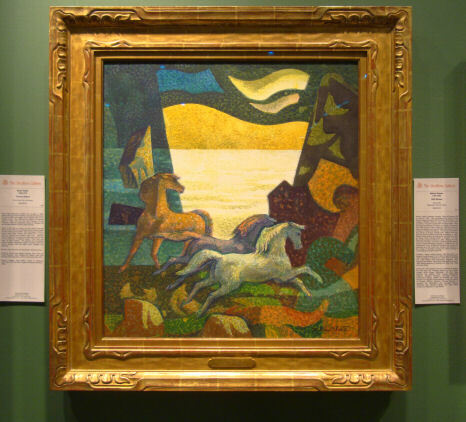 As my friend said, “Pointillism and ponies,” a combination guaranteed to grab my attention! 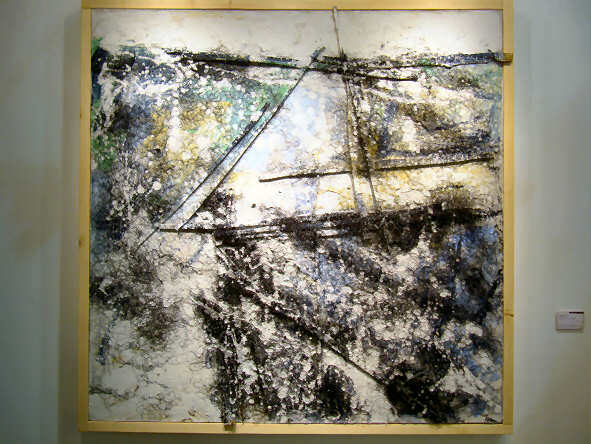 Jiang Xin, “Deconstruction,” 2010, mixed media, 59×59 inches, offered by the Proud Gallery of Beijing, China. No price posted. 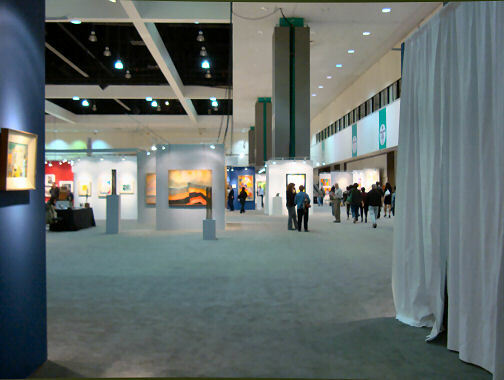 Next up: Art Los Angeles Contemporary. *I’m calling these shows “commercial” to distinguish between them and the kinds of art shows I typically do where individual artists represent themselves. The two types of shows occupy very different spheres of the art world. You’d be hard pressed to find someone in one of the big commercial shows who even is aware that our little street shows exist! Entry filed under: Art Appreciation, LA Art Show, Shows. 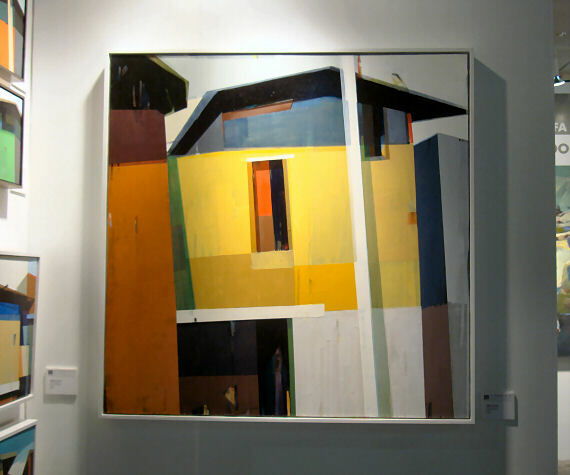 I’d like to know what makes a “small” painting (30×30) worth thousands of dollars. That is so hard for me to get my brain around. The short answer is that prices are set by “the market.” If there’s sufficient demand for a particular artist’s work, the price can get quite high. It’s all a continuum, from the hobby-artist whose paintings sell for a few dollars, all the way up to Picasso whose works go at auction for millions. Most of us fall somewhere between the two extremes, heh. The real trick is figuring out where you fall on the spectrum, and then try to inch your way up! Discovered your site and have been admiring you’re work and have been inspired as well. I am a return to the arts after more than 20 yes since I was a kid type, and finding my way. Barb, How is the art work? I’ve been enjoying your posts, and find that you have been so progressive these last few years. Would enjoy seeing your more recent works.